PhD, Geography, University of Toronto(1994). MA, Geography, University of Calgary(1987). BA, Geography, Beijing Normal University, Beijing, P. R. C(1983) . GIS/RS theory and methods, digital soil mapping, watershed system modeling and scenario analysis, easy geo-computation. 2015: (A.X. Zhu), Ministry of Education, Jiangsu Province; ￥300,000 (Chinese Yuan); Geographic Information Modeling and Process Simulation: 01/01/2015-12/31/2019. 2015: (A.X. Zhu), Natural Science Foundation of China; ￥4,000,000 (Chinese Yuan); Similarity based on approach to predictive mapping: 01/01/2015-12/31/2019. 2015: (A.X. Zhu), Ministry of Science and Technology of China;￥4,580,000 (Chinese Yuan); Integration of Human Activity Model and Earth System Model for Global Change Modeling: 01/01/2015-12/31/2019. 2015: (A.X. Zhu), Jiangsu Natural Science Foundation; ￥300,000 (Chinese Yuan); Mapping spatial distribution of geographic variables using similarity of environmental conditions: 01/01/2015-12/31/2017. 2014: (A.X. Zhu), Government of Jiangsu Province; ￥40,000,000 (Chinese Yuan); Jiangsu Center for Collaborative Innovation in Geographical Information Resource Development and Application: 01/01/2014-12/31/2017. 2013: (A.X. Zhu), Ministry of Science and Technology of China; ￥2,000,000 (Chinese Yuan); Watershed system based approach to pollution control and remediation at watershed scale; 01/01/2013-12/31/2015. 2012: (A.X. Zhu), Ministry of Science and Technology of China;￥1,200,000 (Chinese Yuan); Scenario analysis of environmental and economic benefits of soil-water conservation strategies using watershed system based modeling ; 01/01/2012-12/31/2016. 2011: (A.X. Zhu), Ministry of Science and Technology of China;￥4,500,000 (Chinese Yuan); Parallel computing for spatial statistical analysis and watershed system modeling; 01/01/2011-12/31/2013. 2011: (J.F. Wang, A.X. Zhu, T.X. Yue, and G.H. Liu), Natural Science Foundation of China; ￥2,000,000 (Chinese Yuan); Development of universal estimators for global statistics and spatial variation; 01/01/2011-12/31/2015. 2011: (G.L. Zhang, A.X. Zhu, and L.F. Zhang), Ministry of Science and Technology of China; ￥3,000,000 (Chinese Yuan); Digital soil mapping for East Asian region: a prototype for global soil mapping; 01/01/2011-12/31/2013. 2009: (W. Xiao and A.X. Zhu), Natural Science Foundation of China;￥220,000 (Chinese Yuan); Mapping animal habitats by combining local knowledge with legacy data under GIS; 01/01/2010-12/31/2012. 2009: (A.X. Zhu), Natural Science Foundation of China;￥400,000 (Chinese Yuan); Mapping spatial variation of geographic elements based on the local representativeness of ad-hoc samples; 01/01/2010-12/31/2012. 2008: (A.X. Zhu), Key Basic Research Support, the Ministry of Science and Technology of China; ￥500,000 (Chinese Yuan); Watershed system science and integrated modeling; 01/01/2008-12/31/2010. 2008: (A.X. Zhu), Key Basic Research Support, the Ministry of Science and Technology of China; ￥1,000,000 (Chinese Yuan); Exploration of new horizon for quantification of spatial variation of geographic variables; 01/01/2008-12/31/2010. 2007: (A.X. Zhu), The National Key Technology R&D Program of China;￥600,000 (Chinese Yuan); Development of soil resource inventory tools for arid environment; 11/01/2007-12/31/2010. 2007: (A.X. Zhu), National Basic Research Program of China;￥450,000 (Chinese Yuan); Development of spatial modeling tools for soil water conservation scenario analysis; 01/01/2007-12/31/2012. 2006: (A.X. Zhu and J.E. Burt), NRCS-USDA; $73,308; Development of Business Requirements for Implementing GIS Technology in Natural Resource Inventory and Conservation; 09/01/06-08/31/07. 2006: (J.Posner, H. Jiang, E. Friedman, A.X. Zhu, Y. Zhou), National Science Foundation; $3,099,426.00; IGERT: Training Program on Biodiversity Conservation and Sustainable Development; 03/22/2006-03/21/2011. 2005: (A.X. Zhu), Chinese Academy of Sciences; ￥450,000 (Chinese Yuan); Ecosystems Under the Impact of Human Activities: Model Parameterization across scales; 09/01/05-12/31/08. 2005: (J.E. Burt and A.X. Zhu), NRCS-ARS; $19,000; Soil Resource Mapping for Precision Agriculture; 7/1/05-6/30/06. 2004: (A.X. Zhu) Chinese Academy of Sciences; ￥2,000,000 (Chinese Yuan); Scenario analysis using environmental modeling and GIS techniques; 01/01/05-12/31/07. 2004: (A.X. Zhu and J. Burt) USDA-NRCS; $121,604; Automated Approach for Generating SSURGO Certified Vector Soil Survey from SoLIM, 09/01/04-08/31/06. 2004: (A.X. Zhu, J. Burt) USDA-NRCS, $163,495; Knowledge Discovery from Soil Maps Using Spatial Data Mining Techniques; 07/01/04-06/30/07. 2003: (A.X. Zhu and Q.G. Cai) Commission on Yangtze River Hydrological Research, Department of Hydrology and Hydraulics of China, ￥300,000 (Chinese Yuan); Evaluation of effects of conservation strategies on soil erosion in upper-middle Yangtze River basin; 01/01/04-12/31/06. 2002: (A.X. Zhu and J. Burt) USDA-NRCS; $201,338; Development of Training Program on SoLIM for Soil Survey; 07/01/02-06/30/04. 2002: (A.X. Zhu) Institute of Geographical Sciences and Natural Resource Research, Chinese Academy of Sciences; ￥1,000,000 (Chinese Yuan); Modeling of Spatial Gradation of Geographic Phenomena; 11/01/02-10/31/06. 2002: (A.X. Zhu) Chinese Academy of Sciences; ￥150,000 (Chinese Yuan); Development of detail landslide susceptibility map using GIS, artificial intelligence and fuzzy logic; 01/01/02-12/31/04. 2001: (A.X. Zhu) Asian Partnership Initiative, University of Wisconsin-Madison; $10,000; Landslide Susceptibility Mapping Using GIS, Expert System and Fuzzy Logic; 11/01/01-10/31/03. 2001: (A.X. Zhu and J. Burt) NPS/USDA-NRCS; $117,562; New Technology for Soil Survey for Great Smoky Mountain National Park; 07/01/01-06/30/03. 2000: (H. Lin, A.X. Zhu, B. Shaw, B. Lowery, and G. Kraft) USDA-NRI CGP; $288,388; Assessing Nitrate Contamination in Ground and Surface Waters Using Neural Network, GIS, and Simulation Modeling; 11/15/00-11/14/03. 1999: (A.X. Zhu, K. McSweeney, J. Burt) NRCS-USDA; $417,895; Dane County Soil Survey Update Using GIS, Expert Knowledge, and Fuzzy Logic: A Discovery Prototype; 7/1/99-6/30/04. 1999: (A.X. Zhu) the Graduate School, University of Wisconsin-Madison; $14,600; A case-based reasoning approach to soil mapping. 1998: (A.X. Zhu) Columbia County Parcel Mapping Using GIS; $11,800, Columbia County, WI. ; 11/1/98-12/31/00. 1998: (A.X. Zhu) City of Madison, $5,614; GIS-based network construction and analysis of Metro Transit routes; 11/1/98-5/31/99. 1998: (A.X. Zhu) the Graduate School of University of Wisconsin-Madison; $18,686. Soil landscape parameterization for hydro-ecological modeling: a neural network approach; 7/1/98-6/30/99. 1997: (A.X. Zhu), the Graduate School, University of Wisconsin-Madison; $22,384; Soil Landscape Parameterization for Hydro-Ecological Modelling at the Watershed Scale; 7/1/97-6/30/98. 1994: (A.X. Zhu and B. Dutton), National Park Services; $19,000; Soil Resource Mapping of Glacier National Park, Montana; 7/1/94-6/30/95. 1984: (Dr. Jihua Wu and A.X. Zhu), Ministry of Natural Resources of P.R.C: ￥5,000 (Chinese Yuan); Environment impact assessment of the open coal mining in Ping Su Region of Shanxi Province, China; 7/1/84-8/30/84. Miao, Yamin, A-Xing Zhu*, Lin Yang, Shibiao Bai, Junzhi Liu, Yongcui Deng, (accepted). “The sensitivity of BCS for sampling landslide absence data in landslide susceptibility mapping”. Journal of Mountain Science (in Chinese). Qin, Chengzhi, Xuewei Wu, Jingchao Jiang, A-Xing Zhu, 2016, “Case-based formalization and reasoning method for knowledge in digital terrain analysis——Illustrated by determining the catchment area threshold for extracting drainage networks”. Hydrology and Earth System Sciences. DOI: 10.5194/hess-2015-539. Xie, Jun, Chengzhi Qin, Guirong Xiao, Lin Yang, Qiuliang Lei, Junzhi Liu, A-Xing Zhu, 2015, “Soil property mapping using fuzzy clustering method in small watershed of the red soil region in southern China: A case study of Zhuxi watershed”. Science of Soil and Water Conservation (in Chinese).13(5), pp. 132-139. Wu, Hui, Yongbo Liu, Chengzhi Qin, Junzhi Liu, Jingchao Jiang, A-Xing Zhu*, 2016.”Parallelization of an optimization algorithm for beneficial watershed management practices”. Geomatics and Information Science of Wuhan University (in Chinese). 41(2), pp. 202-207. Rossiter, David G., Jing Liu, Steve Carlisle, A-Xing Zhu, 2015. “Can citizen science assist digital soil mapping?”. Geoderma, 259-260, pp.71-80. Zhou, Chen, Zhenjie Chen, Yongxue Liu, Feixue Li, Liang Cheng, A-Xing Zhu, Manchun Li, 2015. “Data decomposition method for parallel polygon rasterization considering load balancing”. Computers &Geosciences, 85, pp. 196-209. Yang, Lin, Feng Qi, A-Xing Zhu,* Jingjing Shi, Yiming An, In press. 2016, “Evaluation of Integrative Hierarchical Stepwise Sampling for Digital Soil Mapping”, Soil Science Society of America Journal. DOI: 10.2136/sssaj2015.08.0285. Guo, Shanxin, A-Xing Zhu*, Lingkui Meng, James E. Burt, Fei Du, Jing Liu, Guiming Zhang, (Accepted). “Unification of soil feedback patterns under different evaporation conditions to improve soil differentiation over flat area”, International Journal of Applied Earth Observation & Geoinformation. Yang, Lin, A-Xing Zhu*, Yuguo Zhao, Decheng Li, Ganlin Zhang, Shujie Zhang, L. E. Band, (Accept). “Regional Soil Mapping Using Multi-Grade Representative Sampling and a Fuzzy Membership Based Mapping Approach”. Pedosphere. Yang, Lin, Chong Huang*, Gaohuan Liu, Jing Liu, A-Xing Zhu, 2015. “Mapping Soil Salinity Using a Similarity-based Prediction Approach: A Case Study in Huanghe River Delta, China”. Liu, Junzhi, A-Xing. Zhu*, Chengzhi Qin, Jingchao Jiang, Liangjun Zhu, Lin Shen, 2015. “Parallel computing of watershed process simulation guided by geographical laws”, Journal of Geo-information Science (in chinese), 17(5), pp.1-9. Wu, Xuewei, Chengzhi, Qin*, A-Xing Zhu. 2016, “Case-based formalization and inference method of application-matching knowledge on digital terrain analysis”. Process in georraphy (in Chinese). 35(1), pp. 89-97. Ai, Beibei, Chengzhi Qin, A-Xing Zhu, 2015. “Parallelization of Regional Operation Algorithm Using Parallel Raster-based Geocomputation Operators”. Geo-Information Science (in Chinese), 17(5), pp.562-567. Wu, Mingguang, Guonian Lv, A-Xing Zhu, (accepted). “An Improved Map-Symbol Model to Facilitate Sharing of Heterogeneous Qualitative Map Symbols”, Cartography and Geographic Information Science. Yue, Songshan, Jianshun Yang, Min Chen, Guonian Lu, A-Xing Zhu & Yongning Wen*, 2015. “A function-based linear map symbol building and rendering method using shader language”, International Journal of Geographic Information Sciences, 30(2), pp. 143-167. DOI:10.1080/13658816.2015.1077964. Du, Fei, A-Xing Zhu*, Feng Qi, 2015. “Interactive visual cluster detection in large geospatial datasets based on dynamic density volume visualization”, Geocarto International. pp.1-15. Jiang, Jingchao, A-Xing Zhu*, Cheng-Zhi Qin, Tongxin Zhu, Junzhi Liu, Fei Du, Jing Liu, Guiming Zhang, Yiming An, 2016. “CyberSoLIM: A Cyber Platform for Digital Soil Mapping”, Geoderma, Vol 263, pp. 234-243. Yu, Zhaoyuan, Wen Luo, Linwang Yuan, Yong Hu, A-Xing Zhu and Guonian Lu, (in press). “Geometric Algebra Model for Geometry-oriented Topological Relation Computation”. Transactions in GIS. Zhang, Shu-Jie, A-Xing Zhu*, Jing Liu, Cheng-Zhi Qin, Yi-Ming An, 2016. “An heuristic uncertainty directed field sampling design for digital soil mapping”, Geoderma, Vol. 267, pp. 123-136. Huang, Changchun, Yunmei Li, HaoYang, A-Xing, Zhu, Mingli Zhang, Heng Lv, Tao Huang, Jun Zou, 2015.“Evaluation of Geostationary Ocean Color Imager (GOCI) to monitor the dynamic characteristics of suspension sediment in Taihu Lake”. International Journal of Remote Sensing, 36(15), pp.3859-3874. Zhu, A-Xing, Gui-Ming Zhang, Wei Wang, Wen Xiao , Zhi-Pang Huang, Ge-Sang Dunzhu, Guo-Peng Ren, Cheng-Zhi Qin, Lin Yang, Tao Pei and Shengtian Yang, 2015. “A citizen data-based approach to predictive mapping of spatial variation of natural phenomena”, International Journal of Geographical Information Science, 29(10): 1864-1886. Guo, Shanxin, Lingkui Meng, A-Xing Zhu*, James E. Burt, Fei Du, Jing Liu and Guiming Zhang, 2015. “Data-Gap Filling to Understand the Dynamic Feedback Pattern of Soil”, Remote Sensing, 7(9), pp.11801-11820. Yang, Lin, A-Xing Zhu, Shujie Zhang, Yiming An, 2015. “A comparative study of multi-grade representative sampling and stratified random sampling for soil mapping”. Acta pedologica sinica(in Chinese), 52(1): 28-37. Yue, Yaojie, Jian Li, Xinyue Ye, Zhiqiang Wang, A-Xing Zhu & Jing-ai Wang, 2015, “An EPIC model-based vulnerability assessment of wheat subject to drought”, Natural Hazards, 78(3), pp.1629-1652. DOI 10.1007/s11069-015-1793-8. Van Den Hoek, J., Burnicki, A., Ozdogan, M., & Zhu, A. (accepted). “Using a landscape ecology-based analysis to examine the success of forest policy implementation in Southwest China”. Landscape Ecology. Li, Runkui, Xiaoping Rui, A-Xing Zhu, Junzhi Liu, Lawrence E. Band, Xianfeng Song*, 2015. “Increasing detail of distributed runoff modeling by using fuzzy logic in curve number”, Environmental Earth Sciences. 73(7), pp.3197-3205. DOI: 10.1007/s12665-014-3620-z. Wen Wen, Yafeng Wang, Lin Yang , Di Liang, Liding Chen, Jing Liu, A-Xing Zhu, 2015. “Mapping soil organic carbon using auxiliary environmental covariates in a typical watershed in the Loess Plateau of China: a comparative study based on three kriging methods and a soil land inference model (SoLIM)”. Environmental Earth Sciences, 73(1), pp.239-251. DOI: 10.1007/s12665-014-3518-9. Du, Fei, A-Xing Zhu, Jing Liu, Lawrence Band, 2015. “Soil Property Variation Mapping through Data Mining of Soil Category Maps for Hydrological Modelling”, Hydrological Processes, 29, 2491-2503. DOI: 10.1002/hyp.10383. Yue, Yaojie, Xueyong Zou, Peijun Shi, Xinyue Ye, Guofang Hu, A-Xing Zhu, Jing-ai Wang, 2015. “The measurement of wind erosion through field survey and remote sensing: a case study of the Mu Us Desert, China”. Natural Hazards, 76, pp.1497–1514 DOI 10.1007/s11069-014-1516-6. Liu, Junzhi, Zheng Duan, Jingchao Jiang, A-Xing Zhu. “Evaluation of three satellite precipitation products TRMM 3B42, CMORPH and PERSIANN over a subtropical watershed in China”, Advances in Meteorology. http://dx.doi.org/10.1155/2015/151239. Yu, Zhaoyuan, Wen Lu, Yong Hu, Linwang Yuan*, A-Xing Zhu & Guonian Lü, 2015. “Change detection for 3D vector data: a CGA-based Delaunay–TIN intersection approach”, International Journal of Geographical Information Science, Volume 29, Issue 12, pp 2328-2347. DOI:10.1080/13658816.2015.1077963. Yuan, Linwang*, Zhaoyuan Yu, Wen Luo, Yong Hu, Linyao Feng, A-Xing Zhu, 2015. “A Hierarchical TensorBased Approach to Compressing, Updating and Querying Geospatial Data”. IEEE Transactions on Knowledge and Data Engineering, Vol. 27, No. 2, pp. 312-325. Huang, Changchun, Kun Shi, Hao Yang, Yunmei Li, A-Xing Zhu, Deyong Sun, Liangjiang Xu, Jun Zou, Xia Chen, 2015. “Satellite observation of hourly dynamic characteristics of algae with Geostationary Ocean Color Imager (GOCI) data in Lake Taihu”. Remote Sensing of Environment, Vol. 159, pp. 278-287. Liu, Kai, Guoan Tang, Ling Jiang, A-Xing Zhu, Jianyi Yang, Xiaodong Song, 2015. “Regional-scale calculation of the LS factor using parallel processing”, Computer & Geosciences, Vol. 78, pp. 110-122. Zhu, A.X., Liu, J., C. Qin, S. Zhang, Y. Chen, X. Ma, H. Zhang, R. Liu, T. Behrens, T. Scholten, 2015. “Predictive soil mapping with limited sample data”, European Journal of Soil Sciences, Vol. 66, 535–547. Zhu, Tongxing and A-Xing Zhu, 2014. “Assessment of soil erosion and conservation on agricultural sloping lands using plot data in the semi-arid hilly loess region of China”, Journal of Hydrology: Regional Studies 2, pp. 69-83. 2014. Qin, Chengzhi*, Lijun Zhan, A-Xing Zhu, Chenghu Zhou, 2014. “A strategy for raster-based geocomputation under different parallel computing platforms”, International Journal of Geographical Information Science, pp.2127-2144. DOI:10.1080/13658816.2014.911300. Wu, H., Y.B. Liu*, J.Z. Liu, A.X. Zhu, 2014. “Representation of Agricultural Best Management Practices in a Fully Distributed Hydrologic Model: A Case Study in the Luoyugou Watershed”, Journal of Resources and Ecology, 5(2), 179-184. Zhu, A.X., R.X. Wang, J.P Qiao, Y.B. Chen, J. Liu, F. Du, Y. Lin, T.X. Zhu, 2014. “An expert knowledge-based approach to landslide susceptibility mapping using GIS and fuzzy logic”, Geomorphology, 214, pp.128–138. Van Den Hoek, J., M. Ozdogan, A. Burnicki, A.X. Zhu, 2014. “Evaluating forest policy implementation effectiveness with a cross-scale remote sensing analysis in a priority conservation area of Southwest China”, Applied Geography, Vol. 47, pp. 177-189. Liu, J.Z., A.X. Zhu*, Y. Liu, T. Zhu, C. Z. Qin, 2014. “A layered approach to parallel computing for spatially distributed hydrological modeling”, Environmental Modelling & Software 51, 221-227. Shangguan, W., Y. Dai*, B. Liu, A.X. Zhu, Q. Duan, L.Wu, D. Ji, A. Ye, H. Yuan, Q. Zhang, D. Chen, M. Chen, J. Chu, Y. Dou, J. Guo, H. Li, J. Li, L. Liang, X. Liang, H. Liu, S. Liu, C. Miao, Y. Zhang, 2013. “A China Dataset of Soil Properties for Land Surface Modeling”, Journal of Advances in Modeling Earth Systems, 5(2), 212-224. Zhang, S.J., A.X. Zhu, W.L. Liu, J. Liu, L. Yang. 2013. “Mapping detailed soil property using small scale soil type maps and sparse typical samples”, Chinese Geographical Science, 2013, 23(6), 680-691. Li, R.K., A.X. Zhu, L.J. Chen, J.Z. Liu, 2013. “Effects of Soil Parameters in SCS-CN Runoff Model”, Journal of natural resources (in Chinese). Qin, C.Z., L.J. Zhan, A.X. Zhu. 2013, “How to apply the Geospatial Data Abstraction Library (GDAL) properly to parallel geospatial raster I/O?”. Transactions in GIS. DOI: 10.1111/tgis.12068. Zhang, S., A.X. Zhu, J. Liu, L. Yang, 2013. “Soil sampling scheme based on simulated annealing method”, Chinese journal of soil science (in Chinese). Zhang, G., A.X. Zhu, S. Yang, C. Qin, W. Xiao, Steve K. Windels. 2013, “Mapping wildlife habitat suitability using kernel density estimation”, Acta ecologica sinica (in Chinese)，33(23):7590-7600. Liu, J., A.X. Zhu*, S.J. Zhang, C. Qin, 2013. “Large-scaled soil attribute mapping method based on individual representativeness of sample sites”, Acta pedologica sinica(in Chinese). Liu, J.Z., A.X. Zhu*, Y. Liu, C. Qin, L. Chen, H. Wu, L. Yang, 2013. “Parallelization of a grid-to-grid routing algorithm based on grids layering”, Journal of national university of defense technology (in Chinese). Liu, J.Z., A.X. Zhu*, C. Qin, L. Chen, H. Wu, J. Jiang, 2013. “Review on parallel computing of distributed hydrological models”, Process in geography (in Chinese). Jiang, J.C., A.X. Zhu*, C. Z. Qin, L. Yang, F. Liu, S. Zhang, 2013. “CyberSoLIM: knowledge-driven on-line digital soil mapping prototype system”, Acta pedologica sinica(in Chinese). Wu, H.*, Y.B. Liu, A.X. Zhu, J. Liu, 2013. “Review of spatial optimization algorithms in BMPs placement at watershed scale”, Process in geography (in Chinese). Zhu, A.X., P. Wang, T.X. Zhu, L. Chen*, Q. Cai, H. Liu, 2013. “Modeling runoff and soil erosion in the three-gorge reservoir drainage area of China using limited plot data”, Journal of Hydrology, 492, 163–175. Qin, C.Z., L.L. Bao, A.X. Zhu*, R.X. Wang, X.M. Hu, 2013. “Uncertainty due to DEM error in landslide susceptibility mapping”, International Journal of Geographical Information Science, 27(7), 1364-1380. Qin, C.Z. *, L.L. Bao, A.X. Zhu, X.M. Hu, B. Qin, 2013. “Artificial surfaces simulating complex terrain types for evaluating grid-based flow direction algorithms”, International Journal of Geographical Information Science, 27(6), 1055-1072. Yang, L., A.X. Zhu*, F. Qi, C. Qin, B. Li, T. Pei, 2013. “An integrative hierarchical stepwise sampling strategy for spatial sampling and its application in digital soil mapping”, International Journal of Geographical Information Science, 27(1), 1-23. Liu, J.Z., A.X. Zhu*, C.Z. Qin, 2013. “Estimation of theoretical maximum speedup ratio for parallel computing of grid-based distributed hydrological models”, Computers & Geosciences, 60, 58–62. Zhu, A.X., L.J. Chen*, C.Z. Qin, P. Wang, J.Z. Liu, R.K. Li, Q.G. Cai, 2012. “A new paradigm for soil-water conservation assessment: a framework based on watershed modeling and scenario analysis”, Chinese Journal of Applied Ecology (in Chinese). Zhang, S.J. *, A.X. Zhu, J. Liu, L. Yang, 2012. “An Integrative Sampling Scheme for Digital Soil Mapping”, Process in georraphy (in Chinese). Zhang, S.J. *, A.X. Zhu, J. Liu, L. Yang, 2012. 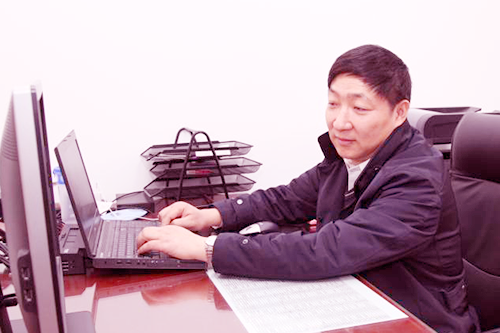 “Sample-based digital soil mapping methods and related sampling schemes”, Soils (in Chinese). Liu, J.Z., A.X. Zhu*, Z. Duan, 2012. “Evaluation of TRMM 3B42 Precipitation Product Using Rain Gauge Data in Meichuan Watershed, Poyang Lake Basin, China”, Journal of Resources and Ecology, 3(4), 359-366. Liu, F., X. Geng, A.X. Zhu*, W. Fraser, 2012. “Soil texture mapping over low relief areas using land surface feedback dynamic patterns extracted from MODIS”, Geoderma, 171–172, 44–52. Chen, L.J., A.X. Zhu*, C.Z. Qin, 2012. “Identification of critical source areas of soil erosion on moderate fine spatial scale in Loess Plateau in China”, African Journal of Agricultural Research, 7(19), 2962-2970. Zhan, L.J., C.Z. Qin*, A.X. Zhu, 2012. “Which type of slope gradient should be used to determine flow-partition proportion in multiple-flow-direction algorithms—tangent or sine? ”, Hydrology and Earth System Sciences Discussions, 2012, 9, 6409-6418. Gao, J. *, J.E. Burt, A.X. Zhu, 2012. “Neighborhood size and spatial scale in raster-based slope calculations”, International Journal of Geographic Information Science, 26(10), 1959-1978. Li, R.K., A.X. Zhu, X.F. Song*, B.L. Li, T. Pei, C.Z. Qin, 2012. “Effects of Spatial Aggregation of Soil Spatial Information on Watershed Hydrological Modeling”, Hydrological Processes, 26(9), 1390-1404. Zhu, A.X. *, M. Lark, B. Minasny, Y. Huang, 2012. “Editorial: Entering the Digital World”, Geoderma, 171-172, 1-2. Qin, C.Z. *, A.X. Zhu, W.L. Qiu, Y.J. Lu, B.L. Bao, T. Pei, 2012. “Mapping soil organic matter in small low-relief catchments using fuzzy slope position information”, Geoderma, 171-172, 64-74. Sun, X.L., Y.G. Zhao, H.L. Wang, L. Yang, C.Z. Qin, A.X. Zhu*, G.L. Zhang, T. Pei, B.L. Li, 2012. “Sensitivity of digital soil maps based on FCM to the fuzzy exponent and the number of clusters”, Geoderma, 171-172, 24 –34. Liu, F., X. Geng, A.X. Zhu*, W. Fraser, 2012. “Digital soil mapping over low relief areas using land surface feedback dynamic patterns extracted from MODIS”, Geoderma, 171–172, 44–52. Li, R.K., A.X. Zhu, L.J. Chen, B.L. Li, T. Pei, C.Z. Qin, 2011. “Seasonal Differences in responses of surface runoff to detail soil information”, Journal of Natural Resources (in Chinese). Lu, Y.J., C.Z. Qin*, W.L. Qiu, A.X. Zhu, 2011. “Sensitivity Analysis of Soil Property Parameter in Typical-sample-based Prediction Model of Digital Soil Mapping”, Scientia Geographica Sinica (in Chinese). Yang, L.*, A.X. Zhu, C.Z. Qin, B.L. Li, T. Pei, 2011. “A Soil Sampling Method Based on Representativeness Grade of Sampling Points”, Acta Pedologica Sinica (in Chinese). Du, F.*, A.X. Zhu, T. Pei, C.Z. Qin, 2011. “The construction of geo-visual analysis environment for raster geospatial data”, Geo-Information Science (in Chinese). Li, R.K.*, A.X. Zhu, C.Z. Qin, L.J. Chen, J.Z. Liu, 2011. “Effects of Spatial Detail of Soil Data on Distributed Watershed Modeling”, Advances in Water Science(in Chinese). Chen, L.J. *, A.X. Zhu, C.Z. Qin, R.K. Li, J. Liu, J.Z. Liu, 2011. “Integration of Hydrological and Ecological Processes at Watershed Scale”, Progress in Geographic Science (in Chinese). Li, R.K., A.X. Zhu*, T. Pei, B.L. Li, C.Z. Qin, 2011. “Response of simulated streamflow to soil data spatial detail across different routing areas”, Progress in Geography (in Chinese). Bao, L.L., C.Z. Qin*, A.X. Zhu, 2011. “Quantitative error assessment of topographic wetness endex algorithms”, Progress in Geographic Science (in Chinese). Burt, J.E., A.X. Zhu*, M. Harrower, 2011. “Depicting classification uncertainty using perception based color models”, Annals of GIS, 17(3), 147-153. Qi, F.*, A.X. Zhu, 2011. “Comparing three methods for modeling the uncertainty in knowledge discovery from area-class soil maps”, Computers & Geosciences 37, 1425-1437. Qin, C.Z. *, A.X Zhu, T. Pei, B.L. Li, S. Scholten, T. Behrens, C.H. Zhou, 2011. “An approach to computing topographic wetness index based on maximum downslope gradient”. Precision Agriculture. 12(1), 32-43. Yang, L., F. Sherif, Y. Jiao, H. Sheldon, A.X. Zhu*, C.Z. Qin, Z.G. Xu, 2011. “Updating conventional soil maps through digital soil mapping”, Soil Science Society of America Journal. 75(3), 1044-1053. Liu, F.*, A.X. Zhu, T. Pei, C.Z. Qin, B.L. Li, 2010. “Application of High Temporal Resolution Satellite Remote Sensing in Identifying Soil Texture Patterns.” Journal of Geo-Information Science (in Chinese). Yang, L.*, A.X. Zhu, C.Z. Qin, B.L. Li, T. Pei, W.L. Qiu, Z.G. Xu, 2010. “A purposive sampling design method based on typical points and its application in soil mapping”, Progress in Geographic Science (in Chinese). Qin, C.Z. *, Y.J. Lu, W.L. Qiu, A.X. Zhu, L.Y. Zhang, L. Yang. 2010. “Application of fuzzy slope positions in predicting spatial distribution of soil property at finer scale”, Geographic Research (in Chinese). Li, R.K.*, A.X. Zhu, X.F. Song, M. Cui, 2010. “Seasonal Dynamics of Runoff-Sediment Relationship and Its Controlling Factors in Black Soil Region of Northeast China”, Journal of Resources and Ecology, 1(4), 345-352. Zhu, A.X., F. Qi*, A. Moore, J.E. Burt, 2010. “Prediction of soil properties using fuzzy membership”, Geoderma, 158, 199-206. Pei, T., C.H. Zhou*, A.X. Zhu, B.L. Li, C.Z. Qin, 2010. “Windowed nearest neighbor method for mining spatio-temporal clusters in the presence of noise”, International Journal of Geographic Information Science, 24(6), 925-948. Pei, T., C.Z. Qin, A.X. Zhu*, L. Yang, M. Luo, B.L. Li, C.H. Zhou, 2010. “Mapping soil organic matter using the topographic wetness index: A comparative study based on different flow-direction algorithms and kriging methods”, Ecological Indicator, 10(3), 610-619. Zhu, A.X., F. Liu*, B.L. Li, T. Pei, C.Z. Qin, G.H. Liu, Y.J. Wang, Y.N. Chen, X.W. Ma, F. Qi, C.H. Zhou, 2010. “Differentiation of soil conditions over flat areas using land surface feedback dynamic patterns extracted from MODIS”, Soil Science Society of America Journal. 74(3), 861-869. Behrens, T., K. Schmidt, A.X. Zhu, T. Scholten, 2010. “The ConMap approach for terrain-based digital soil mapping”, European Journal of Soil Science, 61, 133-143. Zhu, A.X., L. Yang*, B.L. Li, C.Z. Qin, T. Pei, B.Y. Liu, 2010. “Construction of quantitative relationships between soil and environment using fuzzy c-means clustering”, Geoderma, 155(3-4), 166-174. Behrens, T., A.X. Zhu, K. Schmidt*, T. Scholten, 2010. “Multi-scale digital terrain analysis and feature selection for digital soil mapping”, Geoderma, 155(3-4), 175-185. Wang, P.*, A.X. Zhu, Q.G. Cai, H.P. Liu, 2009. “Establishment of conceptual soil erosion model and application in purple soil watershed”, Transactions of the CSAE (Chinese). Qin, C.Z. *, Y.J. Lu, L.L. Bao, A.X. Zhu, W.L. Qiu, W.M. Cheng, 2009. “Simple digital terrain analysis software (SimDTA V1.0) and its application in fuzzy classification of slope positions”, Journal of Geo-Information Science (Chinese). Liu, H.L. *, C.H. Zhou, A.X. Zhu, L. Li, 2009. “Multi-population genetic neural network model for short-term traffic flow prediction at intersections”, Acta Geodaetica et Cartographica Sinica (Chinese). Liu, F.*, A.X. Zhu, B.L. Li, T. Pei, C.H. Qin, G.H. Liu, Y.J. Wang, C.H. Zhou, 2009. “Differentiation of soil spatial variation using land surface dynamics captured by remote sensing techniques”, Soil Information (in Chinese). Yang, L.*, A.X. Zhu, C.Z. Qin, B.L. Li, T. Pei, B.Y. Liu, 2009. “Mapping soil property using fuzzy membership: an example from He Shan, Heilongjiang Province”, Acta Pedologica Sinica (in Chinese). Pei, T.*, A.X. Zhu, C. Zhou, B. Li, C. Qin, 2009. “Detecting feature from spatial point processes using Collective Nearest Neighbor”, Computers, Environment and Urban Systems 33(6), 435-447. Ren, G., A.X. Zhu, W. Wang, W. Xiao, Y. Huang, G. Li, D. Li, J. Zhu*, 2009. “A hierarchical approach coupled with coarse DEM information for improving the efficiency and accuracy of forest mapping over very rugged terrains”, Forest Ecology and Management, 258(1), 26-34. Qin, C.Z., A.X. Zhu*, X. Shi, T. Pei, B. Li, C. Zhou, 2009. “The quantification of spatial gradation of slope positions”, Geomorphology, 110(3-4), 152-161. Liu, J. *, Zhu, A.X., 2009. “Mapping with words: a new approach to automated digital soil survey”, International Journal of Intelligent Systems, 24(3), 293-311. Pei, T., A. Jasra, D.J. Hand, A.X. Zhu, C.H. Zhou*, 2009. “DECODE: A new method for discovering clusters of different densities in spatial data”, Data Mining and Knowledge Discovery, 18(3), 337-369. Zhou, S.Y. *, A.X. Zhu, W.L. Qiu, F. Liu, J.C. Dai, 2008. “GIS-based connectivity analysis and its application in prime farmland protection planning”, Transactions of the Chinese Society of Agricultural Engineering (in Chinese). Yang, F.H. *, A.X. Zhu, K. Ichii, M.A. White, H. Hashimoto, R.R. Nemani, 2008. “Assesing the representativeness of the Ameriflux network using MODIS and GOES data”, Journal of Geophysical Research, Vol. 113, DOI: 10.1029/2007JG000627. Qi, F.*, A.X. Zhu, T. Pei, C. Qin, J.E. Burt, 2008, “Knowledge discovery from area-class resource maps: capturing prototype effects”, Cartography and Geographic Information Science, 35(4), 223-237. Li, B.L. *, A.X. Zhu, C.H. Zhou, Y.C. Zhang, T. Pei, C.Z. Qin, 2008. “Automatic mapping of snow cover depletion curves using optical remote sensing data under conditions of frequent cloud cover and temporary snow”, Hydrological Processes, 22(16), 2930-2942. Qin, C.Z. *, A.X. Zhu, X. Shi, B.L. Li, T. Pei, C.H. Zhou, 2007. “Fuzzy inference of gradation of slope positions”, Geographical Research (in Chinese). Yang, L.*, A. X, Zhu, B.L. Li，C. Qin, T. Pei, B.Y. Liu, R.K. Li, Q.G. Cai, 2007. “Extraction of Knowledge about Soil-Environment Relationship for Soil Mapping Using Fuzzy c-Means (FCM) Clustering”, Acta Pedologica Sinica (in Chinese). Li, R.K.*, A.X. Zhu, P.C. Augello, J.E. Burt, 2007. “Sensitivity of SWAT model to detailed soil information”, Geo-Information Science (in Chinese). Yang, F.*, K. Ichii, M.A. White, H. Hashimoto, A.R. Michaelis, P.Votava, A.X. Zhu, A. Huete, S. Running, R.R. Nemani, 2007. “Developing a continental-scale measure of gross primary production by combining MODIS and AmeriFlux data through support vector machine approach”, Remote Sensing of Environment, 110(1), 109-122. Cui, M.*, Q.G. Cai, A.X. Zhu, H.M. Fan, 2007. “Soil erosion along a long slope in the gentle hilly areas of black soil region in Northest China”. Journal of Geographical Sciences, 17, 375-383. Pei, T.*, A.X. Zhu, C.H. Zhou, B.L. Li, C.Z. Qin, 2007. “Delineation of support domain of feature in the presence of noise”, Computer & Geosciences, 33, 592-965. Qin, C.Z. *, A.X. Zhu, T. Pei, L. Yang, T. Pei, B. Li, C. Zhou, 2007. “An adaptive approach to selecting flow partition exponent for multiple flow direction algorithm”, International Journal of Geographical Information Science, 21(4), 443-458. Shi, X. *, A.X. Zhu, J. Burt, W. Choi, R. Wang, T. Pei, B. Li, C. Qin, 2007. “An experiment using a circular neighborhood to calculated slope gradient from a DEM”, Photogrammetric Engineering & Remote Sensing, 73(2), 143-154. Qin, C.Z. *, A.X. Zhu, B.L. Li, T. Pei, C.H. Zhou, 2006. “Review of multiple flow direction algorithms based on gridded digital elevation models”, Earth Science Frontiers (in Chinese). Qin, C.Z. *, L. Yang, A.X. Zhu, B.L. Li, T. Pei, C.H. Zhou, 2006. “A method for computing topographic wetness index over flat terrain”, Progress in Geographic Science (in Chinese). Qin, C.Z, B.L. Li, A.X. Zhu, L. Yang, T. Pei, C.H. Zhou, 2006. “A strategy for allocating flow in multiple direction using down-slope gradient”, Progress in Hydrological Science (in Chinese). Zhu, A.X., T. Pei, J.P. Qiao, Y.B. Chen, C.H. Zhou, Q.G. Cai, 2006. “A knowledge-based approach to landslide susceptibility assessment”, Progress in Geographic Science (in Chinese)..
Qiao, J.P.*, A.X. Zhu, C.Y. Wu, H.L. Tian, 2006. “Landslide susceptibility analysis based on contribution of intrinsic factors”, Mountain Research(in Chinese). Roth, R., A.X. Zhu*, E. Holbus, J. Papez, J. Quan, 2006. “An automated approach to site selection for ecological restoration in fragmented landscape”, Journal of Geographical Information Science, 12(2), 98-105. Yang, F.*, M. A. White, A. R. Michaelis, K. Ichii, H. Hashimoto, P. Votava, A.X. Zhu, R.R. Nemani, 2006. “Prediction of Continental Scale Evapotranspiration by Combining MODIS and AmeriFlux Data through Support Vector Machine”, IEEE Transaction on Geosciences and Remote Sensing, 44(11), 3452-3461. Li, B.L. *, A.X. Zhu, Y.C. Zhang, T. Pei, C.Z. Qin, C.H. Zhou, 2006. “Glacier change over the past four decades in the middle Chinese Tien Shan”, Journal of Glaciology, 52(178), 425-432. Smith, M., A.X. Zhu*, J.E. Burt, C. Stiles, 2006, “Effects of DEM resolution and neighborhood size on soil survey”, Geoderma, 137, 58-69. Qi, F.*, A.X. Zhu, M. Harrower, and J.E. Burt. 2006. “Fuzzy soil mapping based on prototype category theory”, Geoderma, 136, 774-787. Pei, T.*, A.X. Zhu, C.H. Zhou, B.L. Li, C. Qin, 2006. “A new approach on nearest-neighbor method to discover cluster features in overlaid spatial point processes”, International Geographical Information Science, 20(2), 153-168. Zhu, A.X. *, B.L. Li, L. Yang, T. Pei, C.Z. Qin, G.L. Zhang, Q.G. Cai, C.H. Zhou, 2005. “Predictive Soil Mapping Based on A GIS, Expert Knowledge, and Fuzzy Logic Framework and Its Application Prospects in China”, Acta Pedologica Sinica(in Chinese),. Quinn, T., A.X. Zhu*, J.E. Burt, 2005. “Effects of detail soil spatial information on watershed modeling across different model scales”, International Journal of Applied Earth Observation and Geoinformation, 7, 324-338. Li, W.*, C. Zhang, J.E. Burt, A.X. Zhu. 2005. A Markov chain-based probability vector approach for modeling spatial uncertainties of soil classes. Soil Science Society of American Journal, 69(6), 1931-1942. Li, W.*, J.E. Burt, A.X. Zhu, C. Zhang, J. Feyen, 2004. “Two-dimensional Markov chain for simulating spatial distribution of soil types”, Soil Science Society of America Journal, 68, 1479-1490. Shi, X. *, A.X. Zhu, J. Burt, F. Qi, D. Simonson, 2004. “A case-based reasoning approach to fuzzy soil mapping”, Soil Science Society of America Journal, 68, 885-894. Qi, F.*, A.X. Zhu, 2003. “Knowledge discovery from soil maps using inductive learning”, International Journal of Geographical information Science, 17(8), 771-795. Qiao, J.P., A.X. Zhu, Y.B. Chen, R.X. Wang, 2003. “A 3D visible evaluation of landslide risk degree under integration of GIS and artificial intelligence”, Science in China E: Engineering & Materials Science, 46, 142-147. Zhu, A.X. *, B. Hudson, J. E. Burt, K. Lubich, D. Simonson, 2001. “Soil mapping using GIS, expert knowledge and fuzzy logic”, Soil Science Society of America Journal, 65, 1463-1472. Zhu, A.X. *, D.S, Mackay, 2001. “Effects of spatial detail of soil information on watershed modeling”, Journal of Hydrology, 248, 54-77. Zhu, A.X. 2000. “Mapping soil landscape as spatial continua: the neural network approach”. Water Resources Research, 36(3), 663-677. Pang, S.C., A.X. Zhu. 1999. “Spatial Structure of Accommodation Costs in the Madison area”. Geographic Information Sciences, 4, 59-65. Zhu, A.X. 1999. “A personal construct-based knowledge acquisition process for natural resource mapping using GIS”. International Journal of Geographic Information Science, 13(2), 119-141. Zhu, A.X. 1997. “Measuring uncertainty in class assignment for natural resource maps using a similarity model”. Photogrammetric Engineering & Remote Sensing, 63, 1195-1202. Zhu, A.X. 1997. “A similarity model for representing soil spatial information”. Geoderma, 77, 217-242. Zhu, A.X., L.E. Band, R. Vertessy, B. Dutton, 1997. “Derivation of soil properties using a Soil-Land Inference Model (SoLIM)”. Soil Science Society of America Journal, 61(2), 523-533. Zhu, A.X., L.E. Band, B. Dutton, T. Nimlos, 1996. “Automated soil inference under fuzzy logic”, Ecological Modeling, 90, 123-145. Zhu, A.X., L.E. Band, 1994. “A knowledge-based approach to data integration for soil mapping”, Canadian Journal of Remote Sensing, 20(4), 408-418. Zhu, A.X. 2008. Detail Digital Soil Survey: Models and Methods (in Chinese), Science Press， Beijing, China, ISBN：978-7-03-021521-5, 227 p.
Cai, Q.G., A.X. Zhu, H.X. Bi, L.Y. Sun (editors), 2012. Paradigms for Integrated Soil and Water Conservation Over Main Water Erosion Regions in China (in Chinese), ChinaWaterPowerPress, Beijing, China, ISBN：978-7-5170-0400-4, 286 p.
A-xing Zhu, James E. Burt, Chengzhi Qin, Baolin Li, Tao Pei, Fei Du, 2011.03.16, “Digital Method for mapping the detailed geographic variation”; Original invention; Invention Number: ZL 2008 1 0240506. 4. Vice-Chair for the Pedometrics Division, International Union of Soil Science, 2010-2014. Editorial Board, Annals of Association of American Geographers, 2010-2014. Organizer of a session titled “Fuzzy Mathematics and Geography” at the 102nd Annual Meeting of AAG, 2006, March 7-11, Chicago, Illinois. Organizer of a special session titled “Quantification and modeling of geographic phenomena and processes at landscape scale”, the 2006 Annual meeting of Geographic Society of China, August 18-21, 2006, Lan Zhou, China. Delegate to UCGIS (University Consortium for Geographic Information Science), 1996,1998,1999. Organization Committee for GeoInformatics’99, Ann Arbor, MI, 1999. Organizer of a special session titled “Application of Fuzzy Logic to Soil Resource Inventory”, the 11th World Congress of International Fuzzy Systems Association (IFSA2005), July 28-31, 2005, Beijing, China. Organizer of a session titled “New Technologies for Soil Survey in the 21st Century” at the Annual Meeting of AAG, 2000, April 4-8, Pittsburgh, Pennsylvania. Chair of a paper session at the International Symposium of Geoinformatics and Socioinformatics and Geoinformatics’99, June 19-21, University of Michigan, Ann Arbor, Michigan. Chair of a paper session at the International Conference of Geospatial Science and Technology, June 21-23, California State University at Monterey Bay, California. Chair of the Data Structure Paper Session at the Annual Meeting of AAG, Feb. 27-March 3, 2001, New York City, New York.